So I've finally spotted it! 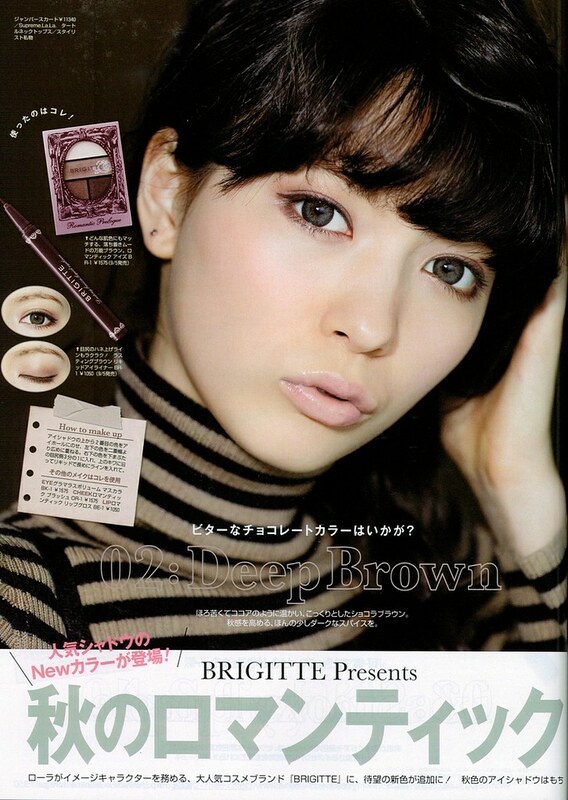 If you haven't already heard, my favourite Japanese magazine VIVI sent out the memo that they are endorsing a new makeup line called Brigitte which includes a full range of colour cosmetics with a heavy focus on eyeshadow and lashes. When I saw a four page spread in my issue from October, I thought you all may want to have a peak too. From what I've seen online, the shadows swatch more pigmented than what they appear in the images before but I'm loving the colour combinations altogether! Here they show you a few autumn looks. 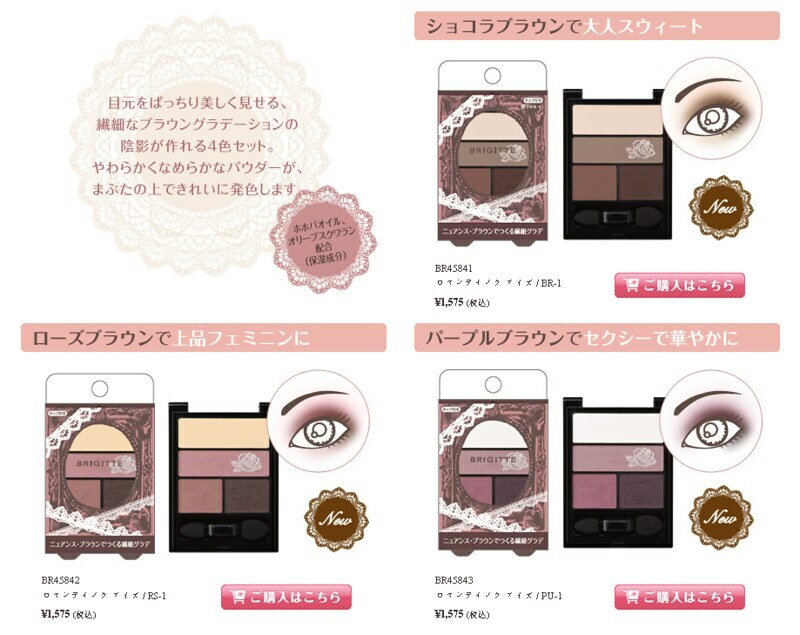 Here's another closer look at the palettes and what Brigitte has to offer. Everything seems to be quite soft, feminine and harmonious, very fitting to my own every day style! I've posted here just a sampling of what the range has to offer. 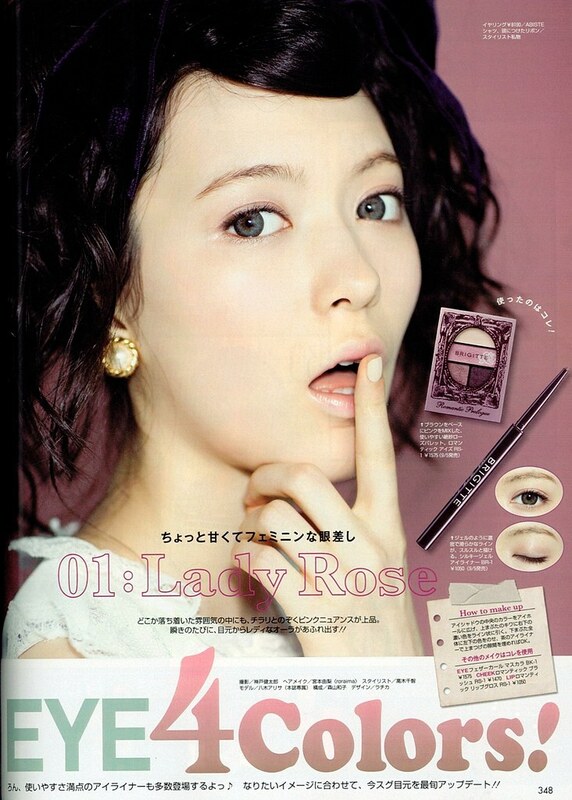 And if you were wondering who's gorgeous eyes are modeling the eyelashes (above), her name is Rola (プロフィール) and she's a resident VIVI magazine model amongst many other adventures. You can find out more from the official Brigitte website. I adore the overall concept and feel of the brand, a little more grown up than say Canmake but still very feminine and a touch mysterious maybe? If you want to get your hands on this outside of Japan, the only place I've seen it offered is Ichibankao online which has the entire range. I just love how natural and subtle the colours look! Love the neutral eyeshadows~~ are there any places to purchase them in Vancouver other than the site? I've never seen them around town unfortunately, they seem to be pretty exclusive. Ichibankao has been the only place I've seen that sells them. How good these eyeshadows are pigmenting? 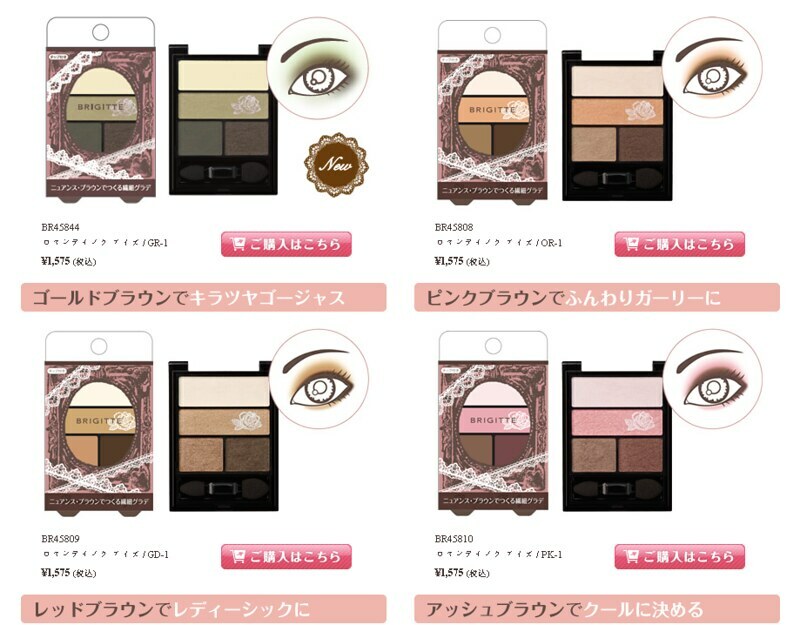 i mean, i think in europe and eeuu we have the idea that everything that comes form asia is softer, Like in asia softer powdery floral scents are more liked , soft colors, delicate things..so we might think that the eyeshadows are also softer. Do those pigment like mac eyeshadws, for example? I've seen a few swatches online that they actually look decent, I'd say medium for sure if not a bit more but certainly not like MAC or MUFE. The ad images look so pretty. Would you tell me your favorite neutral eye shadow pallets? -Wet & Wild Trio "Sweet as Candy"